Finally I have a free week without a recent event, so I will catch up on some not-so-recent events. The Aspen Gallery at Highlands is becoming another place to view exciting exhibits. 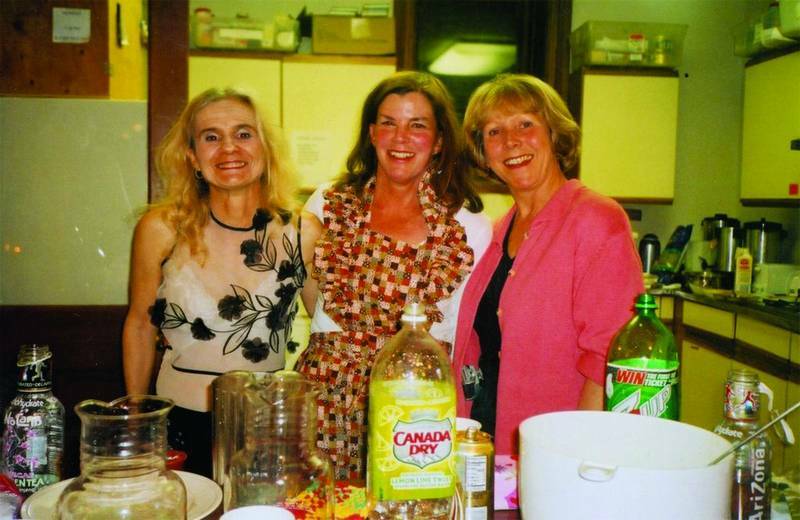 This one in March was covered for me by Denise O’Kelly and photographer Alan Becker.When Marie Gardiner left Aspen she held a big party in the Aspen Community Church for friends, neighbors and clients. Marie had her “Mademoiselle Marie Bridal” and custom sewing shop in Aspen for many years (several of them in The Black Shack). She has now relocated to Saratoga Springs, N.Y. Many of the guests included women who have created their own businesses in Aspen.Molly and Tom Bedell and family held a big picnic and music festival on Sunday, June 3, at their Peace Ranch up the Fryingpan River Valley from Basalt. It was a beautiful Colorado afternoon, and guests sat on blankets and lawn chairs and listened to the music. Jill Sheeley was recently in St. John, U.S. Virgin Islands, visiting her Aspen neighbors Rosa Bielec and Mike Mullen at the beautiful villa they built and just sold. While there, she visited the Gifft Hill School and did a presentation to the students about her books, “Adventures of Fraser the Yellow Dog.”As part of the 2007 Food & Wine Magazine Classic in Aspen a concert and gourmet dinner, titled “Love Snack,” will be held Saturday, June 16, at Belly Up and presented by the Vdara Condo Hotel at MGM CityCenter, Las Vegas. The concert will be performed by The B-52s, and the dinner will be prepared by celebrity chef Martin Heierling with special guests Emeril Lagasse, John Oates and Nobu Matsuhisa. The gala evening will benefit the Children’s Health Foundation and its goal of improving nutrition in schools nationwide. The Children’s Health Foundation has benefited more than 6,000 children since its inception in 2005. In addition to improving nutrition, it has trained ambassador students to help prevent bullying in schools, and provided yoga in schools. Seating at Belly Up is limited, so call Mardell Burkholder for reservations at (970) 920-4750. Mardell is executive director of the Children’s Health Foundation.Undercurrent … And now the aspen and cottonwood trees are sending out their cotton, which builds up in drifts on the lawn and behind the doors in the house.